Turkey Day is a happy day. But why do we cram so much family, food, and football into one intense celebration? – Because they represent important aspects of life. The Thanksgiving feast with all its traditions symbolizes life at its fullest. The turkey I’m about to eat is not just food but a symbol of the overall sustenance that God provides. Family and friends around the table are not just pleasant company but a representation of the heavenly feast when all God’s children will dine together in harmony. Football or shopping are typically little pleasures, but on Thanksgiving and Black Friday they get totally blown out of proportion – watching for 12 hours straight followed by shopping for 12 hours straight. Everything around Thanksgiving is bigger than life – the group assembled around the table, they don’t see each other most of the year but here they enact what harmony and closeness could look like. 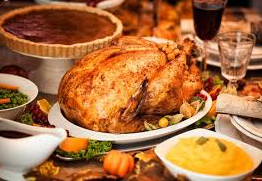 The Thanksgiving meal itself has an average of 4,500 calories – over two days worth of energy for the typical adult. Blessed are You, L-rd our G‑d, King of the Universe, Who brings forth bread from the earth / Who creates the fruit of the vine.